The Meaning of "dowel screw"
"dowel" is from "doule" (part of a wheel), spoken by people in England during 1100-1550 A.D.
"screw" is from "escroue" (hole that a screw turns in), spoken in France during 1000-1400 A.D.
which was from "scrofa" (sow, threads of a screw look like the curl of a sow's tail), spoken by ancient people in central Italy around 700 B.C. 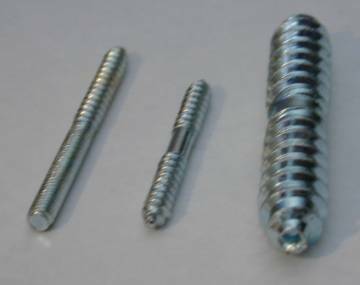 thread is a part of "dowel screw"
Rod with spiral threads and often pointed on both ends. Fastens two soft objects such as wood together. Frequently used with furniture. Usually manufactured from metal. The two objects can be rotated together or apart. To use dowel screws, you have to predrill holes in both objects.